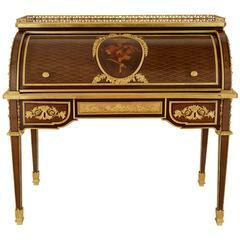 The classic, distinctive diamond shaped parquetry design of perhaps the most acclaimed British furniture maker of the 19th century, Donald Ross, adorns this fine bureau. 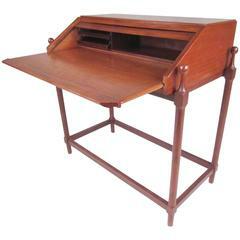 Below its four tapering, fluted legs, the table has wheels on, which it allow it to be moved around easily. 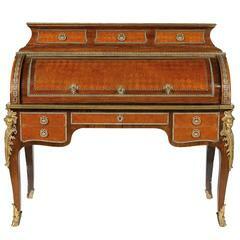 Above the legs there are five drawers: two at each side, and one longer drawer in the centre, all of which have ormolu ring handles mounted onto their front, as well as the diamond parquetry design. The quarter-cylindrical roll top sits above the drawers, and again features a central panel of rosewood and satinwood parquetry on its exterior. 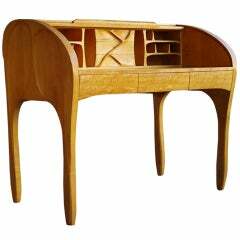 Inside the desk there is a central, leather writing surface and six smaller drawers. To the raised back of the desk there are three further frieze drawers, below a pierced ormolu gallery which runs around the top of the bureau. A table of similar design, by Donald Ross, is housed at the Victoria and Albert Museum in London (W.47-1911). Set with numerous drawers with ormolu borders, handles and escutcheons decorated with bows, on four cabriole legs topped with ormolu female busts, with ormolu hoof feet.